A small painting, 8″x9″, quickly painted with large brushes, numbers 5, 8 and 12, long bristle filberts. The colours, Burnt Sienna, Yellow Ochre and Cobalt Blue are the basic red, yellow and blue. Extras are Chrome Green Light and Raw Umber. Black and white are also used, of course. The video of the painting process will be posted next time. The painting time was less than an hour so the time lapse will not be too compressed. I followed my usual procedure by painting the sky to completion and treating all elements of the distant landscape above the horizon line as part of the sky, using ‘sky colours’. These colours contain a lot of white which should not be introduced into the mid and foreground paint mixes until much later in the painting process. Shadows, shadows and more shadows. Then mid tones and finally highlight colours. You will notice that the trees are going over the edge of the painting. This is difficult to achieve if the painting stops abruptly at a sharp edge, as with a stretched canvas. Having a strip of masking tape onto which the painting overflows helps prevent the subconscious tendency to ‘terminate’ the painting before the actual edge. When the tape is removed the clean straight edge cuts off any ‘fuzzy’ or faded out bits which can ruin the finished look of the painting. If, like many painters, you have a number of paintings ‘in storage’ which probably will never be framed but you like showing, the clean white edge almost acts as a frame and gives a ‘finish’ to the painting. I am preparing the time lapse video for the next posting and it will show the process especially the use of ‘large’ brushes to achieve apparent details, especially in the trees. 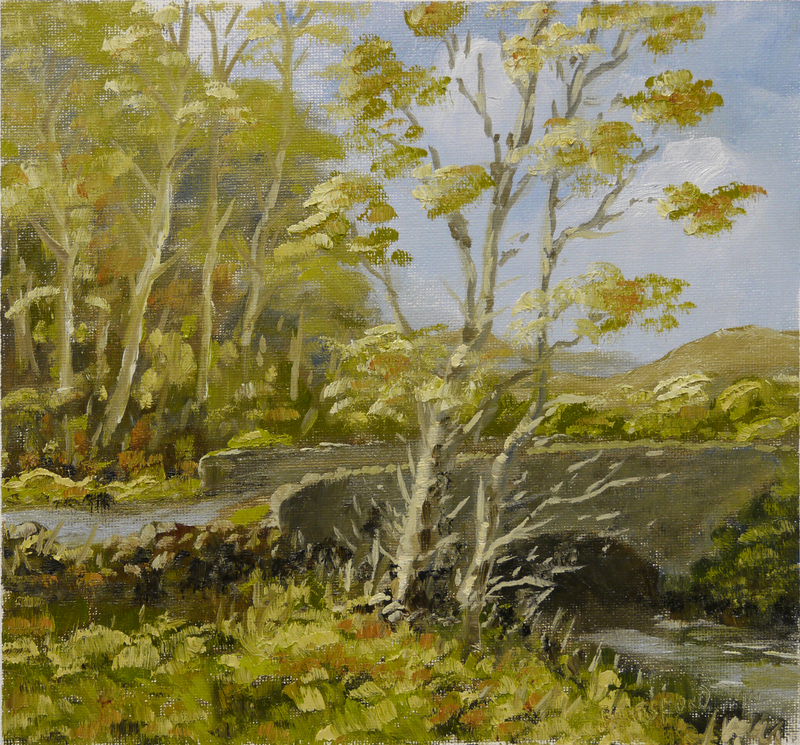 This entry was posted in Oil Painting and tagged Art, Autumn Colours, Culture, Education, Inspiration, Irish landscape, Oil Painting Instruction. Bookmark the permalink. I found your work through your daughter’s site M.G.L. I love crocheting so I found her first. I commented on her blog and she sent me an uproariously humorous response. I painted lots years ago. Then…babies. I also love painting and since my children are now grown we all want me to get back to it. I appreciate your work very much and would love to own a small piece. (Something I could afford). There are no links to you selling anything. What are you doing in this regard? Next, since you are making these lovely U-T videos with accompanying notes on your site what is the best way to get the most out of these tools? Using the videos and notes to learn the most? Since you are doing all this work you obviously mean for someone (like me) to be learning something. For me a 1-2-3- step by step is good since I wouldn’t be nearly so advanced. Could you please comment? Thank you Vicki. To answer your first question. I tried the commercial route for an artist, many years ago, one man shows, galleries etc. and I didn’t like it. Art is compromised by commerce. So I started a graphic design and print company which is commercially successful. This frees the ‘real art’ from commercial considerations. New technology is changing the world of art, sometimes for good but also for bad. We are bombarded by images, many created by technology (Photoshop, Painter, CGI, etc.). Much of modern art is lacking the ‘hand of the artist’. I’m trying to use this new technology, not to create art, but to share it. I am creating a range of cards, prints, posters which will, if the image is liked by the owner, have a provenance in the form of a U-T video. Its creation, from blank canvas to finished piece, will be available as a curiosity or an instruction. Your second question, the videos are an important part of the sharing process. I assumed that the only people interested in the blog would be artists who have some experience of painting and are curious about the method I use, and possibly feel they could learn something. I forgot that there might be visitors who do not have the basics. So I will create a separate page or PDF which will have the basics, specifically for those who would like to start painting. I regard my method and materials (usually the same 4 colours and 4 brushes) as simple and try to get that across in the blog. If a viewer likes a painting (there are over 20 on the blog) they could copy the process as practise. As the video is HD (can be viewed full screen), be stopped, rewound, played over and over, so a beginner or inexperienced painter could progress at their own pace. Thanks for pointing out my little oversight and thanks again for your interest. Your blog is a wonderful treasure!